I've been blogging about website traffic development, customer churn and acquisition rates, responsive, content-rich websites, and inbound digital marketing. I promised a future post to take a dive into the numbers behind direct email marketing, social media, and blogging. I promised to explain how an effective, consistent campaign has the potential to generate traffic volumes necessary to help achieve a planned revenue growth from $650,000 to $950,000 within a four-year time frame. This is that post! The goal - 200,000 website visitors over a four-year period. Our data table shows the key performance indicators required for achieving our 4-year revenue growth plan. The number of customers will be increased by around 600, the average sales per customer will be 70% lower than the historical average, the churn will be reduced from 10% to 3%, the customer acquisition rate will improve from 4% to 34%, the lifetime value of each customer will improve from $15,000 to nearly $23,000, the cost of acquiring new customers will drop from over $28,000 to less than $1,000 and web traffic will increase from 200 visitors per month to over 8,000. In order to achieve these goals, the "opted-in" email contact database must be increased from 850 to 11,000+, the social audience must be increased from less than 1,000 to around 15,000 and blog subscribers have to be developed from zero to 1,700. Take a look at the 24-month threshold in the table above - overall sales per month have not increased significantly from the start point. Churn rates are coming down, customer acquisition is up but, most importantly for future growth, the email, the social and the blogging audiences have all been substantially increased. This is the foundation upon which the 50% sales growth planned for years 3-4 will be built. Organic site traffic - although not a major component of the total traffic, it's still an important component of the overall traffic strategy. By optimizing our site for local SEO, taking advantage of an increasing domain authority and ensuring our business is listed consistently and proficiently across the 100+ online directories such as Yellow Pages, Yext, Google, Bing, etc., then we plan for around 4,000 organic site visits over the four-year period. Web traffic from direct email - the concept is quite simple. Remember, our business has a fully responsive, content rich website. The content is well written, relevant, and useful to the audience we're targeting. Our objective is to send regular emails, say twice per week, to our existing 850 contacts. Most of the emails we send will not be a direct solicitation for the sale of our products. Instead, we'll be distributing information that we think will be interesting and relevant to our contacts. Each email will include at least one "call-to-action" (CTA) and our objective is; firstly have enough "zip" in the subject line to get our audience to open the email, secondly for them to read it and finally, to have them click on a CTA. Achieving pre-set goals for each of these metrics is what will help us maximize our email ROI. The "click" is what we're working for because that's the vehicle that's going to bring a contact to our website for more information. Once at our website, then we have a visitor we can nurture toward our goal of eventually converting to become a customer. We start with a goal to send out 850 emails twice per week, for a total of 6,800 emails in the first month of our campaign. Over the 4-year period, if we successfully expand our email contact database to 11,000+ then, using the same blast frequency over the four-year period, we will launch over 2.2 million emails. We're counting on about 110,000 website visitors (55% of the total we need) from our 2.2 million emails. In order to achieve this goal, we need an average of 25% open rate and an average click-through of 20% on the opened emails. These are aggressive goals and the only way they'll be achieved is through the distribution of useful, relevant content to an engaged audience alongside the use of email marketing best practices. The quality of our email content & our audience is of paramount importance! Website traffic from blogging - we're going to start publishing our blog with a frequency of once per week. We're going to automatically notify all our blog subscribers as we publish and we're going to generate click activity from those blogs that lead back to our website. In our example we start out with no subscribers so, an important element of our strategy must be to sign-up subscribers to our blog. In our model, we assume we build a subscription base of 1,700 over the four-year period. We're counting on bringing around 42,000 visitors to our site as a result of our blogging and content activity over the four-year period. In order to achieve this traffic volume from our blog audience alone, we would need 420,000 blog views over 4-years and a 10% click-through rate on various CTAs back to our site. Our plan is to publish one blog per week for the entire 4-year period and to ramp-up our subscription base from zero to 1,700 over the same time period. Well, based on these targets, the maximum number of impressions we can get from our blogging activity is the sum product of the number of blogs published multiplied by the subscription base for each of the 48 periods, which only totals 95,000. We cannot generate 430,000 views from a total viewing audience of 95,000. In fact, as shown in the table above, the best we can expect is around 5,000 visits. It's clear we must expand our audience beyond that which we can achieve from the expected blog subscription in order to achieve our goal. The quality of our blogging content is of paramount importance! There are two methods we're going to work to achieve our audience expansion. Firstly, leveraging the social currency of "shares" to expand our reach. A key to our blogging strategy is to deliver content that our subscriber base may also consider being helpful and interesting to their audience In doing so, we hope to motivate them to share our content with their audience. Clearly, if we are successful, then we expand our reach. The more shares we get posted to Facebook, LinkedIn, Twitter and Google+, the greater the number of eyeball impressions on our content. In our example, we have assumed 50% of our subscribers read our content and 5% of them share the content. We assume each subscriber that shares, has their own social audience averaging 750 and, that 20% of this secondary audience will read the content that's been shared. Finally, 10% of this secondary audience readership will click on one of our CTAs back to our site. This activity will increase our site visits by around 36,000 over the four-year period. Secondly, leveraging our own social audience will further expand our reach. Every time we publish a blog we're going to automatically publish to our social media accounts - i.e. Facebook, Twitter, LinkedIn, and Google+. In our business case model, our cumulative social audience over the 48 months is 340,000. We've assumed we get 20% of our primary social audience to read our content and achieve a 10% click-through by those readers. This activity results in an additional 7,000 site visits over the four-year period and is summarized in the table below. It should be clear, the faster we expand our social audience then the faster we build our email contact list, our blog subscriber list, and our website visits. We're now going to focus on dealing with the shortfall as the final component for achieving our target of 200,000 site visits. There's really only one place left for us to go to to get additional traffic, and that's what we're going to have to pay for! Our shortfall is 38,000 so, what's it going to cost and what's our strategy? Let's focus on Twitter and Facebook as our source for filling the shortfall. We know we don't have the domain authority for a Google "popular" keyword search strategy to work and we can't afford it anyway. We could most likely do better with long-tail keyword search and, we may have to resort to this if we can't generate the remaining traffic we need from Twitter and Facebook. First, we have to decide a budget and, for the purposes of our business model, we've set it at $250 per month. 40% of this is going to be spent on design and graphics, to maximize the potential of the content and its visual impact, which leaves $150 to spend on pure advertising to extend our "reach". We're going to spend 60% of the funds on Facebook and 40% on Twitter, with our objective being to obtain additional "impressions" or "eyeballs" on our content than we are able to generate organically. 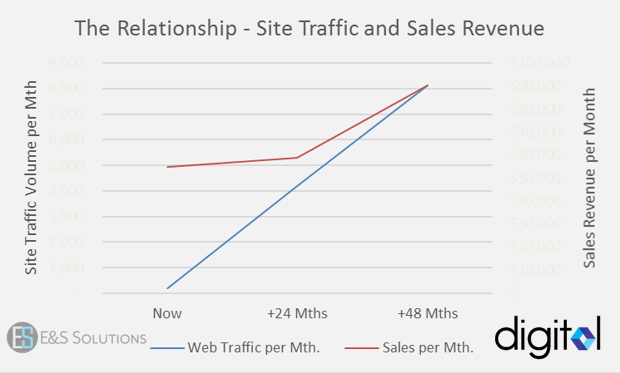 This model suggests we can generate an additional 525 site visits per month from the two social platforms. Over a 48-month period, this totals 25,000 additional site visits. Prior to incorporating this "paid" component of our traffic volume, our shortfall was 38,000 so, even with the contribution from our paid advertising campaign, there's still a gap of 13,000 visits to be filled. We still have options to eliminate the remaining shortfall. We can increase our blog frequency and we can increase our email frequency. However, we have to be careful not to inundate our audience with content, risking turning them off and potentially reducing their engagement with us. If we decide an increase in our content publication frequency is not acceptable for our audience, then we have to pay for the remaining traffic we need. Another $75 per month should be sufficient. You should have a good understanding by now of the logic and methods for developing the traffic that's needed to fulfill the modeled goals. The traffic concepts explained are quantitative in nature but, the audience engagement rates and audience building tactics are more "artistic", and just as vital to master if the quantitative objectives we need to execute the plan are to be replicated in real life. If the audience is either too small or not engaged, then the plan fails! Building an engaged audience in a local market is a key part of the overall strategy. This is where it becomes possible to leverage a strong local, physical presence. Our business is not going to become a national destination site for web traffic. However, in the scheme of things, our traffic objective is very modest. Amazon has nearly 50 million unique daily visitors and we're just looking to build up to 250 or so a day. We know we're not going to be the next Amazon! We'll blog soon about audience building and audience engagement as these capabilities are clearly vital for our plan to be successfully executed. Although the potential for developing traffic should be clear from this business case, later we'll develop the concepts and tactics for developing an audience of the scale and level of engagement we need to be successful. Why not download our free e-book for a comprehensive read on the office products industry. Learn how and why there's still an opportunity to accomplish a profitable business transformation for a small to medium size reseller of office products.